US President Donald Trump's wife, Melania, arrived on Tuesday in Ghana on the first leg of her virgin, solo tour in Africa, which was billed as an opportunity to chart her own diplomatic path. 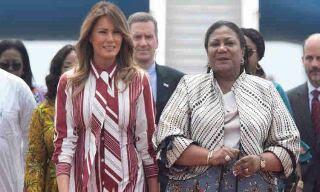 The first US lady resigned from an overnight flight from the Andrews airbase near Washington and a red carpet at Kotoka International Airport in Akra. She met her counterpart Rebecca Akufo-Addo with her Ghana and a group of local students with yellow and brown uniforms carrying the stars and stripes of the US and the Ghanaian flag. I learned that the previous model smiled and looked relaxed as she was entertained by a band of traditional ballads and dancers. The first lady's office said the tour would be a "diplomatic and humanitarian visit" that would focus on the #BeBest # campaign for "children and their well-being". It will also highlight the work of the US International Development Agency, even at a time when her husband's government intends to reduce US aid around the world. Apart from Ghana, he is going to visit Malawi, Kenya and Egypt before returning to Washington early on October 7th.